You don’t expect flat tires – but they do happen. This one occurred on a very hot day in the center of a small village. 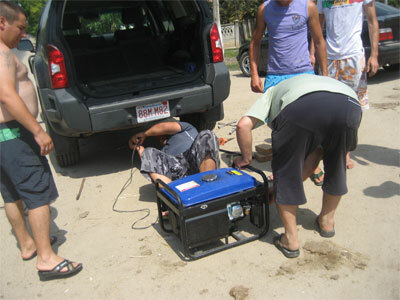 Seeing me having difficulty removing the cumbersome spare, a group of locals appeared offering to help – which they did. Soon a group of nine contributed tools, advice, and muscle power. One arrived in his second-hand BMW with his own tool kit. The man with the red hat was the ‘expert’ and who did the hard work successfully and in short order. It was all in good cheer- plus a good tip that surely bought several rounds of beer. In the next larger town I had the punctured tire repaired and returned to its place.